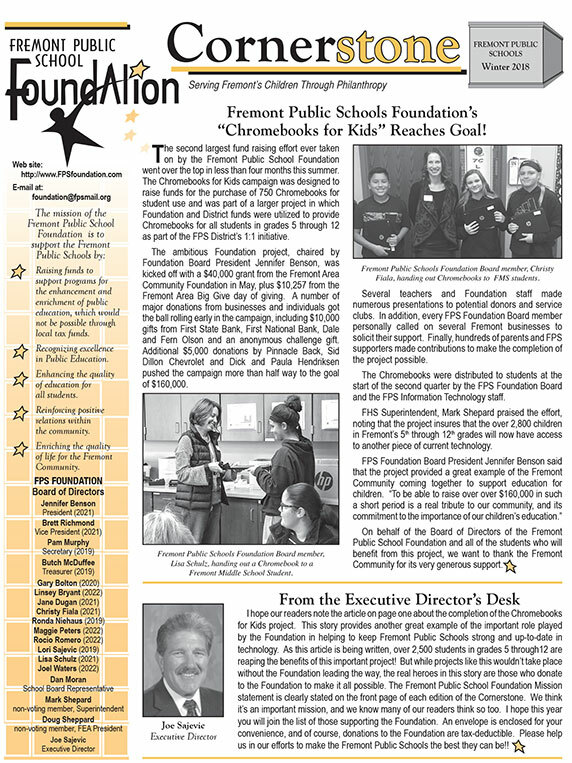 Twice a year we publish a newsletter focusing on the Fremont Public School Foundation projects, events and general news. It will highlight the past six months, announce upcoming events, list contacts for each graduating class, acknowledge those whom we have lost in this time period, along with a plethora of other information. Over the next six months, it is our goal to deliver the newsletter in a digital format. The costs expended for print and postage can be better spent by applying it directly to the students currently enrolled in the Fremont Public Schools. To help us reach our goal, please subscribe to our newsletter by filling out the form below. Here are digital links to our past issues of the Cornerstone Newsletter. To access the desired newsletter simply click on the link.